Herb Francis with brothers Stewart Francis of New Liskeard and Clinton Francis of Toronto. 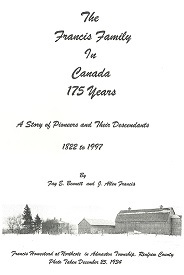 [S2] "Ontario Birth Registrations online at Ancestry.com", FamilyTree.Com, (Name: Subscription www.ancestry.ca;), Wilberforce Twp., Renfrew Co., ONtario (Reliability: 3). [S8495] "Ontario Birth Registrations online at Ancestry.com", FamilyTree.Com, (Subscription www.ancestry.ca), Wilberforce Twp., Renfrew Co., ONtario (Reliability: 3). [S8576] Census - Canada, Ontario, Renfrew Co., Wilberforce Twp., - 1911, (digital images, ancestry.ca (www.ancestry.ca)).